What is Freshly's philosophy on nutrition? Do you use Organic/Non-GMO ingredients? Are your meals low in carbs, calories, fat, and sodium? How do I sort the menu by nutritional values? Do you cater to special medical or dietary needs? Do you have vegetarian or vegan meals? Are your meals designed to be Paleo? Yes! Our meals are 100% certified gluten-free by the Gluten Intolerance Group (GIG), and our facility does not handle or store any gluten-containing ingredients. 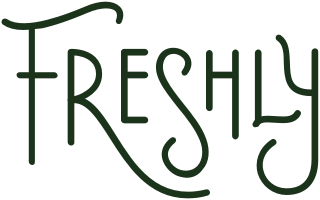 Freshly has always developed meals using real, whole, nutrient-dense foods that are naturally gluten-free, like high-quality proteins, healthy fats, nutrient-dense carbohydrates, and veggies of course. We know many of our customers prefer to avoid gluten, even if they do not have an allergy or intolerance to gluten. All of the nutrients and fiber found in gluten-containing grains can be found in other grains or veggies so you don’t have to have a sensitivity in order to enjoy our delicious, gluten-free meals.